Things are sure sizzling on the land use front, with the hottest activity being a ramp up of community advocacy for improving the Bighouse building design and for deciding which Residential Infill Project (RIP) proposal the LUTC will recommend for CNA to support. 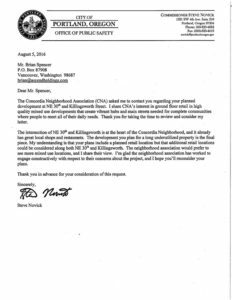 We are encouraged by the letters from the mayor and commissioners Saltzman and Novick (see below) supporting the CNA’s professionally-crafted design improvement suggestions for the four-story “mixed use” apartment building going up at the northeast corner of 30th Avenue and Killingsworth. We remain hopeful that at least some, if not all, of the ground floor units currently designated residential only can perhaps be optimized by converting them for use by either retail or residential tenants, as the current commercial storefront zoning guidelines clearly intend – and our city leaders agree. Although the construction clock is ticking, it is not too late to consider any changes that may be possible — be sure to check back for project updates as they become available. Although the RIP process has completed its formal public review and comment phase, there is still an opportunity to provide input on the three different proposals from the Stakeholders Advisory Committee (SAC), on which LUTC chair Garlynn Woodsong served. 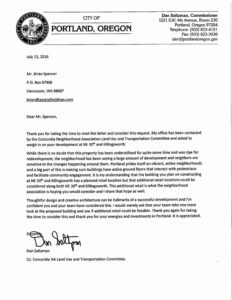 The LUTC will recommend at the Sept. 13 board meeting that CNA send a letter supporting a modified version of the SAC’s Housing Diversity Perspective proposal to Portland Planning Commission as they agree on a preferred proposal for city council’s approval before year’s end. To refresh your memory, the RIP’s purpose is to establish new code, before the full 2035 Comprehensive Plan is completed in 2017-18. The intent is to reduce house size and increase the range of housing types to address community concerns about the scale of new homes and the current housing supply challenges. Our recommendations will be distributed via the LUTC Community email list and the CNA website so interested people can comment at the board meeting. For more info, see PortlandOregon.gov/bps/article/580581. 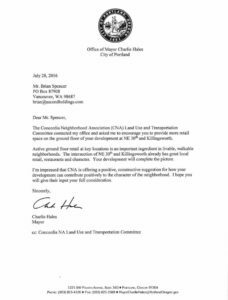 Email questions to LandUse@ConcordiaPDX.org. Jay Fesler was approved to fill the open committee position created when Ken Forcier moved to Rainier, Washington. Jay is a project manager for Ankrom Moisan Architects, served on the Bighouse Redesign Team and is looking forward to helping with the launch of the Concordia Design Standards initiative this fall. Concordia residents are always welcome at CNA LUTC Meetings, 7 p.m. every third Wednesday in the Community Room at McMenamins Kennedy School. For more information, visit the LUTC section of the CNA website, send your questions to LandUse@ConcordiaPDX.org and/or email LUTC_Secretary@ConcordiaPDX.org to be added to the LUTC notification list.